You have certainly heard of the 7 habits of highly effective people, the bestseller by Covey, which spawned lots and lots of similar books like the 7 habits of highly effective teens, happy kids, families, and what not. So when you see a cover of a book titled 'The Self-Destructive Habits of Good Companies', it is sure to catch your attention. And guess what? The habits are seven in number. Just like the seven deadly sins. 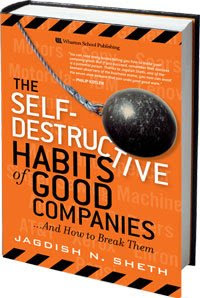 The author, Jagadish Sheth, lists seven habits that can afflict good companies. If left unchecked, these habits can destroy companies. Dozens of companies are used as case studies here to highlight these seven 'self-destructing habits'. Engaging style of writing, a constant stream of companies with sometimes fascinating nuggets of information that most would be unaware of, and a succinct boxed list of bullets at the end of each chapter that lists the "Things that lead to ...", "The Warning Signs of ...", and "How to break the habit of ..." should be useful enough in its own right. One of the major points that the author makes is that functions in a company need to be better integrated and functioning cohesively to avoid the (seven) self-destructive habits. While working as independent, self-contained units may have been the fashion some time back, and even provide a sense of independence and success, and may indeed work in some cases, some of the times, in many others it may breed a sense of fiefdom, inertia, and paralysis, and more so in not-so-good times when the need is to revisit old assumptions, this silo-ed setup can actually hamper progress. While it is true that companies could suffer from more than one self-destructing 'habit', these habits are sometimes used in a loose manner. Does Detroit suffer from design dependence, or denial, or a mix, or a third, fourth, fifth trait too. or all? Not clear from the book. The style of the book is not academic. There is no grand theory of failure that is sought to be built here. Unlike, say, The Innovator's Dilemma , that introduced readers to a variant of creative destruction - "Disruptive innovation", and has become a major 'theory' that is now sought to describe just about any innovation or imitation wrought upon the market by tech companies, this book is not going to do any such thing. It is an airport paperback, if you may. The author lists habits that he states can and do mostly lead to companies going down the tube, and then parades dozens of companies in support of that assertion. The narrative style is somewhat similar to Ram Charan. While Ram Charan uses personal anecdotes from his numerous consulting engagements with companies and CXOs, Sheth in this book describes companies and how they stumbled, or in some cases declined all the way to extinction, as a way of illustrating these habits. IBM, Microsoft, Motorola, (Encyclopedia) Britannica, GM, AP, Merck, Sony, Singer, Nutrasweet/Equal, Lego, Avon, DeBeers, USPS, AT&T, Boeing, Enron, Worldcom, Sony, Timex, Xerox, ... - makes you wonder if a second edition of this book may have some newer, familiar names like Toyota, Google, VMWare, Salesforce.com, Facebook - all companies that are hugely successful today, though VMWare seems to be facing headwinds, and Salesforce.com seems to be running into the 800 lb gorilla of enterprise software, Oracle, and the last word in the battle between Microsoft and Google has not been written, not even the beginning of the end of the first chapter I would assert. If you write about companies in a time set too much in the past, the lessons have been mostly taught (not necessarily learned), there is not much new that can be presented, and the context too much in the past to interest the average reader. Just how many times do you want to be taught about the lessons from the Dutch Tulip mania? If you write about companies in the present, you run the risk of getting things horribly wrong, or basing your analysis on facts that are not completely known at the time of writing. The same is somewhat the case with this book. The discussion on Boeing and Airbus is a case in point, where the fortunes of these two companies have been oscillating between success and failure for more than 10 years now. Airbus' taking the lead from Boeing, Airbus' success with the A380, then the failure with numerous delays and technical and manufacturing glitches, to Boeing's success with the Dreamliner project, and then its miseries over ethics scandals.... the seesaw continues. Of particular interest to many people would be the several pages devoted to GM, especially given the near-death throes that the American auto industry seems to be in these days. These pages are hugely informative and readable in themselves, and may well prompt the reader to wonder in exasperation, several times, how could these companies have been so oblivious to fast-approaching disaster! "What he (Jack Smith, in the early 1980s) found was that GM needed more than twice as many people as Toyota to build the same number of cars. But when he presented his findings to GM's executive committee, they reacted with total disbelief and dismissed his report." "The editorial (Seattle Times in the 1980s) asked prophetically, 'How many Detroit workers will lose their jobs when oil prices soar again and gasoline rockets past a dollar a gallon?' ... Then, to reinforce its own bias, Detroit built crummy small cars. When nobody wanted them, the automakers could say, 'We told you so.'" "According to (BMW CEO) Panke, if you removed all their labels and badges, 'you would have a hard time recognizing who's who, what is what.'" "... in April 2005, Dan Neil, the auto writer for the Los Angeles Times, gave a negative review to GM's new and much-hyped Pontiac G6. ... Looking at all 11 brands (including those offshore), he concluded that GM's overall strategy must be to remove any unique characteristics in its automobiles for the sake of global efficiencies. ... GM's response to the article? The company pulled all its advertising from the Los Angeles Times until further notice." "it made the strategic blunder of allowing its own dealers--Pontiac, Buick, and Olds--to carry Honda, Toyota, and Nissan." Chapter One, as a PDF.